Troubleshooting covers the most common issues that prevent players from playing Shadowbane. If your problem is not listed here, check if it is a known issue or seek further help from the community discord server. Solution: If your system is 32-bit, you must use the 32-bit launcher found in the Shadowbane file directory. Cause: The patch server is down or rebooting. Solution: Please wait and try again in a few minutes. Cause: There is a typo in the MAC Address, Auth Code, or both or you have not downloaded the newest launcher. Solution: Double check the numbers entered in the website match those on your launcher app or download the latest version of the launcher. Cause: You may be connected to a VPN which is assigning you a default, incorrect MAC address for this games purpose. Solution: Disconnect from your VPN, re-open the launcher and register your correct MAC address on the forums. You can open Command Prompt & type ipconfig /all to get a listing of all adapters and list out the correct MAC address. Solution: This is intentional. Only one account can be registered to a device. Cause: Conflict with the application and operating system. Solution: Launch the application as administrator. Cause: The account has not been verified, or you have registered less than 5 minutes ago. Solution: Follow the First-Time Login instructions, or wait 5 minutes to log in after registering. Solution: The server will be back up shortly. If not, please check the forum or discord server for more information. Solution: Close the client. Right-click SB.exe inside the Shadowbane directory, and click Properties. 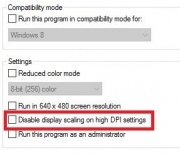 Uncheck "Disable display scaling on high DPI settings". Re-launch the game via the launcher. Problem: Error thrown at launch "Entry Point Not Found" "The procedure entry point MiniDumpWriteDup could not be located in the dynamic link library. C:\WINDOWS\system32\nvspcap.dll"
Solution: In your Shadowbane folder, delete the dbhhelp.dll File. Copy the dbhelp.dll file from your C:\Windows\System32 directory and place into your Shadowbane folder. Solution: The game should not be closed from anywhere except the character select screen. If the client was previously closed via the task manager or you experienced a client crash, log back into the same character and quit to the character select screen prior to switching characters. You may have to repeat this for any character that experienced an improper logout. Cause: Microsoft Windows 10 Fall Creators Update removed this functionality (Source) With the Fall Creator's Update, it appears that Windows 10 changed the way the Windows API reacts to a function used by the Shadowbane client to provide infinite camera panning when using the middle mouse click or alt and left click. In prior versions, when performing a SetCursorPos[ition] call to the OS to keep the cursor in the middle of the screen, the OS sent a MouseMove message to the client with the updated coordinates. The update removed that behavior. The client has been modified to send itself a MouseMove message now when updating the cursor position to fix this. Solution: To fix this issue, you must download and this SB.exe version. To use, replace your sb.exe in your Shadowbane directory with this modified version. Solution: While you can not change the default UI settings, you can fully customize the position of all UI elements by holding shift, then left-clicking to drag. The layout you settle upon is automatically saved and can be imported when making new characters. See UI Setup for detailed support. Cause: Graphical or one-off glitches. Solution: Type /stuck into the chat and press enter. Wait 10-seconds, and your character will be teleported outside of the object. Solution: The game should not be closed from anywhere except the character select screen. If you do so by accident, or experience a client crash, log back into the same character and quit to the character select screen prior to switching characters to avoid an inappropriate multibox penalty. Problem: Group formation is not working. Cause: Standing inside a city grid, or participated in combat recently. Solution: Group formations do not work inside city grids or on anyone who participated in combat in the previous 60 seconds. This page was last modified on 13 March 2019, at 11:09.